BONN, Jan 31 2015 (IPS) - The first global treaty dealing with biodiversity was the Ramsar Convention – predating the Rio processes by 20 years. Ramsar aims to conserve wetlands, the usefulness of which has been undervalued – even the eminent French naturalist of the 18th century, the Comte de Buffon, advocated their destruction – and which have suffered large losses in recent decades. Wetlands are vital for birds – and especially waterbirds – but it is also the case that the birds are vital to the wetlands, playing a major role in maintaining nature’s balance. Far from being wastelands, wetlands provide invaluable services, replenishing aquifers that supply drinking water and filtering out harmful pollutants. By maintaining a healthy environment, wetlands help ensure human well-being. While the Ramsar Convention has had to deal with a broader spectrum of wetland issues over the years, it should be remembered that its full title includes “especially as waterfowl habitat”, and in AEWA, Ramsar has a strong ally with a clear focus on waterbird conservation in the African-Eurasian Flyway. The areas designated as Ramsar Sites form an important part of the network of breeding, feeding and stopover grounds that are indispensable to the survival of the 255 bird populations of listed under AEWA. 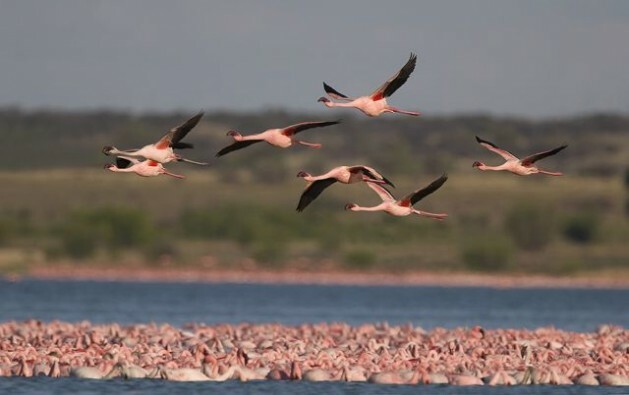 Ramsar Sites are vital “hubs” in the network of habitats that constitute the African-Eurasian flyway along which millions of birds migrate in the course of the annual cycle. They include habitats as diverse as the Wadden Sea in Europe and the Banc d’Arguin in Mauritania, both also designated as UNESCO World Heritage Sites and important staging posts for birds migrating between Arctic breeding grounds and wintering sites deep in Africa. Despite being often far apart geographically and different morphologically, these sites are inextricably linked by the birds that frequent them. The definition of “wetland” extends to fish ponds, rice paddies, saltpans and some shallow marine waters, so Ramsar has sites of significance to other species covered by the Convention of Migratory Species, under which AEWA was concluded. Examples are the Franciscana dolphin (the only dolphin species to inhabit wetlands) found in the estuary of the River Plate and along the coast of South America; and the European eel – a recent addition to the CMS listings – which spends most of its life in rivers but spawns and then dies in the Sargasso Sea. But it is waterbirds that have the strongest links to wetlands and the future of many species is in doubt as a result of the continuing reduction in area of these most productive of habitats. Of great concern is the fate of the mudflats of the Yellow Sea which are under increasing pressure from human developments because tied to them is the fate of a number of threatened shorebirds. Lake Natron in the United Republic of Tanzania is the only regular breeding site of over two million Lesser flamingoes. Applications have been made to exploit the area’s deposits of soda ash leading to fears that irrevocable damage would be done to the site resulting in the species’ extinction. The habitats of Andean flamingoes – the Puna and Andean Flamingoes – are facing similar problems as illegal mining activities have eroded the nesting sites and contaminated the water, exacerbating other threats such as egg collection. Fragile wetland ecosystems also fall victim to man-made accidents – the explosion of the Deepwater Horizon oil platform in the Gulf of Mexico and the Sandoz chemical works fire in Basel, Switzerland in 1986 being just two examples of countless incidents, both leading to the death of thousands of birds and fish. Government representatives will gather in Paris later this year in the latest effort to seek agreement on the steps necessary to arrest the causes of climate change. Wildlife is already feeling the effects and one of the best ways to ensure that animals can adapt is to ensure that there are enough robust sites providing the habitat and food sources at the right time and in the right place. The theme chosen by the Ramsar Convention for this year’s campaign is Wetlands for Our Future and there is a particular emphasis being placed on the role of young people. While wetlands are of course vital for humans, they are no less important for the survival of wildlife and to a great extent also depend on the birds that live in them. It is the role of AEWA to provide a forum where the countries of Europe, West Asia and Africa can work together to maintain the network of sites making up the African-Eurasian flyway. Best wishes with these important and vital projects. It is so encouraging to know that in the midst of all of the destructive turmoil in the world, there are people with convictions and commitments to life and life-affirming work. Good luck.